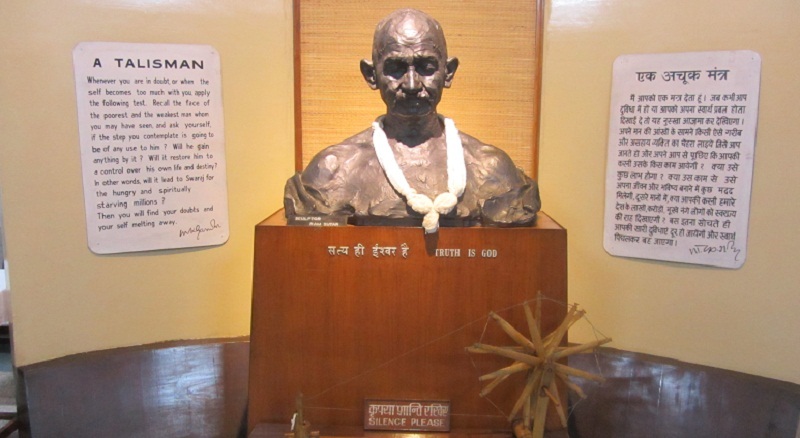 National Gandhi Museum popularly known as Gandhi Museum is located on the ring road opposite to Rajghat in New Delhi. This museum is dedicated to the Father of Nation Mohandas Karamchand Gandhi. It was established in Mumbai in 1948 just after the assassination of Gandhi. Later it was relocated to many places in the past before coming to New Delhi. Later it was established in New Delhi in 1959 and it was officially inaugurated on 30th January 1961 by President of India, Dr. Rajendra Prasad. The Gandhi Museum is a memorial dedicated to Mahatma Gandhi. The Museum holds a collection of Gandhi’s study and his work. It is divided into multiple galleries and sections. It showcased the books and articles about his life and work. Walking stick, Shawl and Dhoti of M K Gandhi are also present here, which were worn by him at the time of the assassination are the main attraction of the museum. Recorded speeches of Mahatma Gandhi along with pictures also featured in the museum. More than 6000 pictures of Mahatma Gandhi and other freedom fighters are one of the main attractions of the museum. Urn and bullet which were used to kill him is also displayed. In personal belongings, Charkha (Spinning Wheel), his clothes and many more other items are placed here. National Gandhi Museum also displays a large number of paintings and articles of Mahatma Gandhi. Museum also has a library and membership of library can be availed on a very nominal charges. Currently, library inside Gandhi’s museum holds more than 35,000 books and articles. Books which were written by Gandhi also displayed here.